Could it be that the Skating Minister, that most iconic of Scottish paintings, was painted not by Henry Raeburn but by the French émigré artist Henri-Pierre Danloux? This proposal caused furore in the art world when it was first put forward in 2005 and the question is still very much unresolved. Like a lot of these historical debates, the controversy is less interesting in itself, than for the various academic and political manoeuvres it has occasioned. Scottish pride and the credibility of a hundredweight of merchandise ride on the outcome - this was, after all, the image which in 2005 the new Scottish Parliament had chosen to put on its Christmas cards! The originator of the dispute was Dr Stephen Lloyd, since 2012 Curator of the Derby Collection at Knowsley Hall in Merseyside but until 2009 a Senior Curator at the Scottish National Portrait Gallery. In a paper published in the Burlington Magazine in July 2005 Dr Lloyd noted that there had always been doubts concerning the attribution of the Skating Minister.. A catalogue to the National Galleries collections produced in the 1970s states, for instance, that "the "type of canvas, style of painting and scale of figure have no parallel in Raeburn's work"; the 1983 illustrated guide questioned the provenance: "there are difficulties in accepting the family tradition that it was painted by Raeburn, whose style was quite unlike this" (p. 474-5). For Lloyd and other critics a major Raeburn exhibition held in Edinburgh and London in 1997 threw into sharp relief how unusual the painting was among Raeburn's works in terms of paint-handling and composition. A portrait of Admiral Duncan in the National Portrait Gallery encouraged Dr Lloyd to consider Danloux as the possible painter. are widely thought to echo the silhouette of the Skating Minister. Although Stephen Lloyd's revisions have been widely accepted , he has a knowledgable and well- respected opponent in David Thomson, retired Director of the National Portrait Gallery and the foremost expert on Raeburn. The chief organiser of the 1997 exhibition, in 2004 Dr Thomson co-authored a popular study of the Skating Minister for the Galleries. He has been seconded by a younger specialist Dr David Mackie, who is currently preparing a catalogue raisonnée of Raeburn's work. Thomson's views were widely canvassed in the Scottish press and in July 2006 he replied to Lloyd in the Burlington Magazine. There is no reason to doubt the traditional identification of the skater as the Reverend Robert Walker (1755-1808), minister of the Canongate Kirk and member of the Edinburgh Skating Society, which met regularly to skate on the frozen lochs of Duddingston or Lochend. However, there is no record at all of the painting itself before 1902. In 1914 it was offered for sale at Christie's by Beatrix Scott, Dr Walker's great-granddaughter,but failed to make the reserve of £1,000. The art historian James Grieg noted in his papers at the time that it was "not a Raeburn". In 1949 it was auctioned by Christie's in a sale of "Sporting pictures and paintings" and acquired for the National Galleries for the comparatively modest sum of £525. The then Director of the Galleries Sir Ellis Waterhouse was confident the painting was by Raeburn and professed himself well-pleased. In Dr Lloyds' view, however, the low price realised suggests that other buyers remained doubtful. The portrait was painted by Raeburn in 1784. I have always understood that Raeburn considered it his masterpiece, the pose being so good and the lovely frosty atmosphere of the sky and the ice with all the marks of the skates. Dr Walker was a great skater. On his death, Sir Henry Raeburn gave the picture to his widow, my great-grandmother. After her death, it came to my mother. The tradition that Walker and Raeburn were friends is confirmed by the minister's will drawn up in 1798 which nominates Raeburn as one of the nine trustees appointed to look after his estate. There is no mention of the painting in the list of items bequeathed to his son John. If not Raeburn, then who else? There were various other Scottish portraitists working in Edinburgh at this time - David Allan, Alexander Nasmyth, Archibald Skirving. According to Dr Lloyd only the latter was sufficiently accomplished to have created the Skating Minister, but is excluded because he worked almost exclusively in pastels. Unfortunately, there is no documentation at all to connect the work with Danloux either - though the dates are possible. Danloux emigrated to London in 1792 and settled among the French colony in Soho where he set himself up successfully as a portrait painter. He is known to have travelled to Edinburgh in 1796, 1797 and 1798 where he painted the comte d'Artois and his family, in comfortable exile in Holyroodhouse, as well as various society figures, such as Admiral Duncan. Danloux kept a detailed journal of the comings and goings of the émigré community and his English clients. This is published, but not accessible on the internet - It does not mention Walker, but it would be nice to get a feel of how inclusive his record really was. There is also a bit of an unanswered question about the dating of the portrait. Most art historians, including David Thomson, favour a date in the mid-1790s, which would coincide with Danloux's presence in Edinburgh. 1784, the date given by Beatrix Scott, is too early even for Raeburn, who only returned to Scotland from Rome in 1786. Walker was active in the Skating Society for a long period, from 1780 into the 1800s, so that is no real help. He was born in 1755, so in the mid-1790s he would have been forty, which looks about the age of the man the portrait. Walker is in his clerical attire, but a costume historian could also surely date that stock and hat; to me, the dress certainly looks consistent with the 1790s. The picture is unusually small for a Raeburn (76.2 cm x 63.50 cm). Dr Lloyd describes it as a '"cabinet" composition'. The surface has developed an irregular craquelure which is not found in Raeburn's other oils. The painting was subjected to x-ray analysis. The results, published for the first time in 2013, showed an absence of the lead-white underpaint which Raeburn generally used in the flesh of his sitters. The style and brushwork are also atypical. Dr Lloyd notes that Raeburn's painting after 1786, is characterised by dramatic lighting effects, deep shadows, rich colour and a loose handling of paint. The Skating Minister in contrast is carefully drawn, the palette muted and there is a virtual absence of shadow. More telling still is the composition itself. Raeburn virtually never depicted figures in motion in this way. The graceful skater is skilfully captured in perfect balance, with one leg behind his body. On the other hand, there are several parallels in Danloux's work. 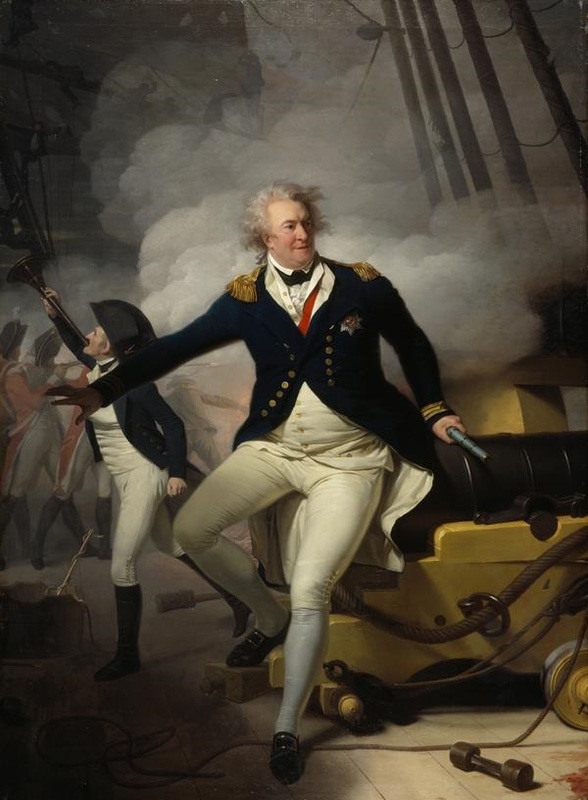 Indeed, Dr Lloyd's attention was first drawn to Danloux by the pose of the officer in the background of Danloux's portrait of Admiral Duncan, painted in 1798, in the Scottish National Portrait Gallery. He has subsequently identified a number of other parallels. 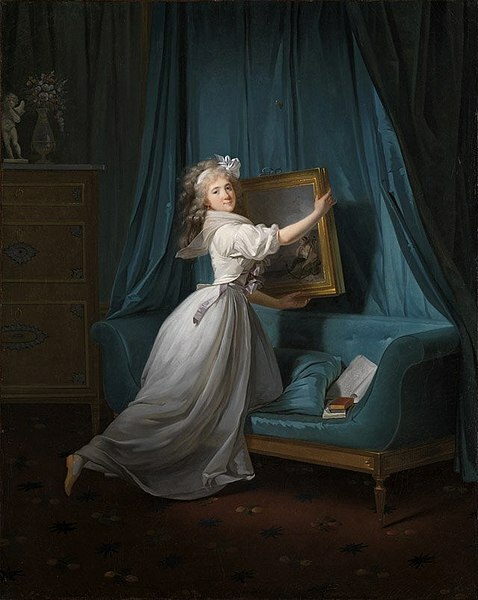 This, for example is Danloux's portrait of the famous émigré courtesan Rosalie Duthé, painted in 1792. 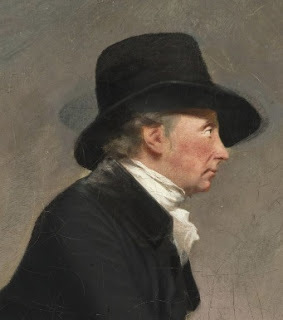 Some aspects of the painting are highly characteristic of Raeburn: the repainted angle of Walker's hat, the presence of lines scored with the wrong end of the brush; the scuffed pink paint used for the cheeks. The way the coat shines through the white material of his cravat is "absolutely typical Raeburn". On the other hand, the balance of scholarship is with Dr Lloyd. In 2012 he edited a collection of essays on Raeburn with Viccy Coltman, professor of 18th-century History of Art University of Edinburgh. In this he published his x-ray findings for the first time, prompting a new, more favourable, round of articles in the press. In 2012 he also publicised his views in an article on Raeburn for the ArtUk website. Certainly, people had treated the picture for some time with doubt, but I had never seen anyone's name associated with it, " he told the Sunday Herald. It was a Raeburn exhibition in Edinburgh and London in 1997-98 that sparked Laing's doubts. "It was only when I went to the Raeburn exhibition in 1997 that Danloux occurred to me, and I did say it to some people but never did anything about it. It was just a hunch, backed up by my knowledge of the two artists.'' The active figure reminded Laing of a painting by Danloux of Mademoiselle Rosalie Duthe hanging a painting: "He was good at showing a graphic, active figure performing, which is unusual in British and French painting of the era. "It would be tricky that it is a Frenchman who is about to say - in front of Scots - that this is not by Raeburn, by your Scottish artist, but by a Frenchman, " he told the Sunday Herald yesterday. The lack of documentary evidence is, however, still a major stumbling block. Personally, I think it is worth standing back for a moment and asking what it is which makes this little picture so appealing and so suited as a modern Scottish national symbol? It is surely the Reverend's pose, private and purposeful but at the same time slightly playful, gliding over the ice with an unself-conscious kick of the back leg. It is a perfect image of a man of the late Enlightenment - and so very.....well, Danloux. This small picture, showing a figure in action, is quite unlike other known portraits by Raeburn. 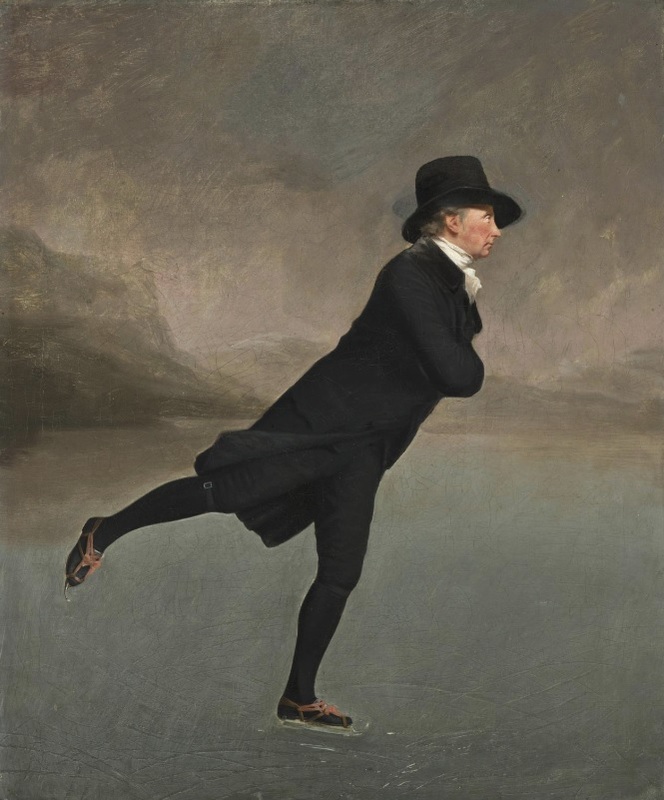 It was in the mid-1790s that his inventiveness, which might have had a freer rein in a different climate, led him to paint the unique little full length of his skating friend, the Revd Robert Walker, better known as The Skating Minister (NG Scot.). Its combination of poise, precision, and humour have made it by far Raeburn's most famous painting; indeed, by a quirk of taste, since its virtual rediscovery in 1949 it has gained a degree of popularity unique in British art. 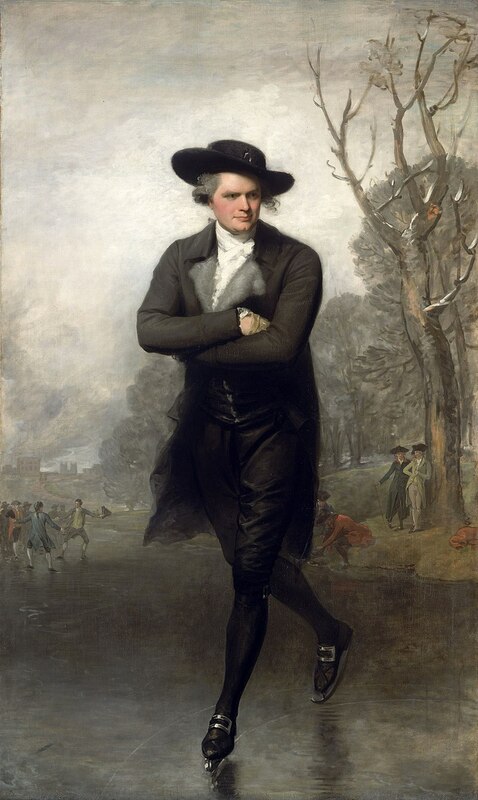 The most famous painting associated with Raeburn, depicting Reverend Dr Robert Walker (1755–1808) Skating on Duddingston Loch, also known as ‘The Skating Minister’ a damaged and restored work acquired cheaply at auction in 1949 by the Scottish National Gallery, has long had its attribution doubted by many observers on account of its unusual small-scale format and the artificially balletic posture of the silhouetted figure gliding over the frozen loch. I have argued elsewhere (The Burlington Magazine, July 2005) that a more likely painter of this sporting portrait is the versatile French émigré artist, Henri-Pierre Danloux, who was active in Scotland during the late 1790s. Recent images of the picture taken with x-radiography and infrared reflectography certainly demonstrate emphatically that the painting is utterly alien to Raeburn’s normal mode of underpainting, where lead white paint is heavily used to lay in the facial features, and which is mostly absent in ‘The Skating Minister’. The vast majority of independent authorities on European painting around 1800 reject the traditional Raeburn attribution and are supportive of the proposed Danloux re-attribution. Thomson, Duncan. “Raeburn Revisited: The 'Skating Minister'.” The Burlington Magazine, vol. 149, no. 1248, 2007, p. 185–190. Tim Cornwell, "Henry Raeburn's Skating Minister on thin ice after x-ray study", The Scotsman, 20 January 2013. The Remaking of Scotland: Nation, Migration, Globalisation 1760-1860, an exhibition presented in Edinburgh at the Scottish National Portrait Gallery, 16 June 2018 – 27 June 2021", BooksandIdeas.net, 13 September 2018. I know this painting well (lived over half my life in Scotland), but I have to say it's never sat easily with the rest of Raeburn's œuvre for me. I can easily believe it's a Danloux. I don't understand the fixation with it "having to be" a Raeburn for reasons of "pride". I prefer Ramsay, personally.